SeqStudio's cartridge design makes CE equipment easier to use. Thermo Fisher Scientific has launched a new cartridge-based capillary electrophoresis (CE) system geared for researchers seeking low-throughput Sanger sequencing and fragment analysis. Aimed at the oncology research and genome editing markets, among others, the company says the new tool is designed to eliminate the need for trained CE technicians and, as a result, broaden the reach of CE technology into labs that may not have previously considered it. The system, named the Applied Biosystems SeqStudio Genetic Analyzer, uses a cartridge system that combines the capillary array, polymer reservoir and anode buffer designed to simplify and significantly reduce hands-on preparation. The system is designed to allow sequencing and fragment analysis runs on the same plate without the need to change any consumables and further pushes Thermo Fisher tools and platform into “smart” technology with a system that can provide self diagnosis, is interactive and provides easy data sharing via the cloud. According to Kim Kelderman, vice president and general manager of genetic analysis at Thermo Fisher, outside of next-generation sequencing, which operates as a separate division, the company has three platforms for genetic analysis: microarrays, PCR and capillary electrophoresis. Even with those, the company felt it had a hole to fill. To date, CE systems have required in-house personnel with very specialized skills to prepare a run. 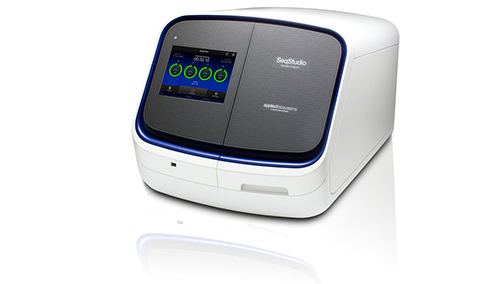 SeqStudio’s cartridge-based design eliminates that need and makes Sanger sequencing and fragment analysis more broadly available. Areas where Kelderman sees immediate demand for the system including in healthcare, clinical labs, companion diagnostics, very targeted genetic testing, and the research area for target validation. Kim Caple, vice president and general manager for capillary electrophoresis at Thermo Fisher, said that the easier-to-use and lower-cost instrument will help bring the method to emerging markets and countries where both the CE expertise and the availability of the more expensive traditional systems are not prevalent. “This system allows labs that would never have considered (CE) before to actually not only do Sanger sequencing and fragment analysis, but to acquire it in a cost-effective manner,” Caple said. The SeqStudio will be available globally in the second half of 2017, and is already in use around the world by select customers.